Make sure your GED is the real deal, take it in person. A diploma mill is a online high school or university that sells worthless degrees. While it can be tricky identifying these fake schools, it isn’t impossible (check out Diploma Mill or Real Online Degree? 10 Ways to Spot the Fake). Once you know a few key facts, you can easily determine if that online GED program you’ve been exploring is real or a dangerous scam. I’m worried about whether my online degree will be respected. I just completed my bachelor's online and am ready to send out my resume. Should I use my cover letter to reveal to potential employers that I earned my degree online? Do employers respect online degrees? Here is the official Get Educated list of 40+ fake college accreditation agencies that claim to oversee a variety of online college and university degree programs. Most of these agencies "accredit" diploma mills or degree mills. Consumers Beware: NONE of these accrediting agencies are recognized as college accreditors in the U.S. by the Council on Higher Education Accreditation or the U.S. Department of Education. As such, colleges claiming “accreditation” by these agencies are not accepted as valid providers of online degrees and should be approached with great caution if college credibility is important to you. Remember, most diploma mills and degree mills are accredited—but by fake or phony agencies that the degree mills themselves own and operate! Confused about degree mills? 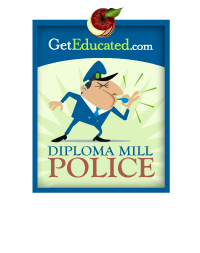 Check out the Diploma Mill Police's list of suspected degree mills. Report suspected diploma mill scams. 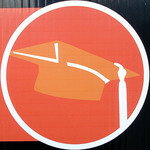 Become a Diploma Mill Police Deputy, link up with Get Educated on Facebook or Twitter, and help stop degree mill scams. If you're going to attend college, whether online or on campus, you'll want to attend one that is properly accredited. Accreditation provides for the independent review of education programs for the purpose of determining if that education is of uniform and sound quality. College accreditation is important if you want to have a public record of your learning that will be widely accepted by employers, professional associations and other colleges and universities. Some realize what they are doing, but an escalating number are being duped by degree mills that operate sophisticated Internet fraud schemes promising consumers they can get a degree fast online. These phony colleges, aptly named diploma mills, thrive on the sale of fake diplomas. Online College Degree Mills: How Prevalent Is the Scam? Are degree mills really such a problem? Most people assumed not—until 2003, when the U.S. Government Office of Accountability undertook the first study of government employees who used federal tuition aid programs to buy a fake college diploma online. That study, “Diploma Mills Are Easily Created and Some Have Issued Bogus Degrees to Federal Employees at Government Expense,” revealed an epidemic of false diplomasand education scams. The Congressional investigation uncovered 400 government employees, including upper echelon managers, who had decided to buy a degree using government tuition assistance programs or who had listed bogus colleges on their job applications. Help! Choosing an online college is an overwhelming task. I have a list of more than 20 possible colleges. I’m favoring one that is nationally accredited by the Distance Education & Training Council (DETC). Will my degree be accepted by employers? My career counselor told me national accreditation (like DETC) is not as good as attending a regionally accredited online college. Which is better: regional accreditation vs. national accreditation? And does it really make any difference? The truth? One type of online university accreditation is not necessarily “better” than another if you take “better” to mean “better academically.” However, there are real benefits to attending a regionally accredited online college versus a nationally accredited college.